Concorde Group’s newest restaurant is a delight to the senses with its mid-century modern decor and a menu that utilizes a large wood-burning grill and oven. Inside Bridgette Bar. Photograph by Jared Sych. FOOD | Chef-driven, wood-fired cuisine. DECOR | Historic brick warehouse gone mid-century modern. DISH | Lamb sausage with cilantro vinaigrette, labneh and fried egg. TIP | Wondering about wait times? Text 403-700-0191. 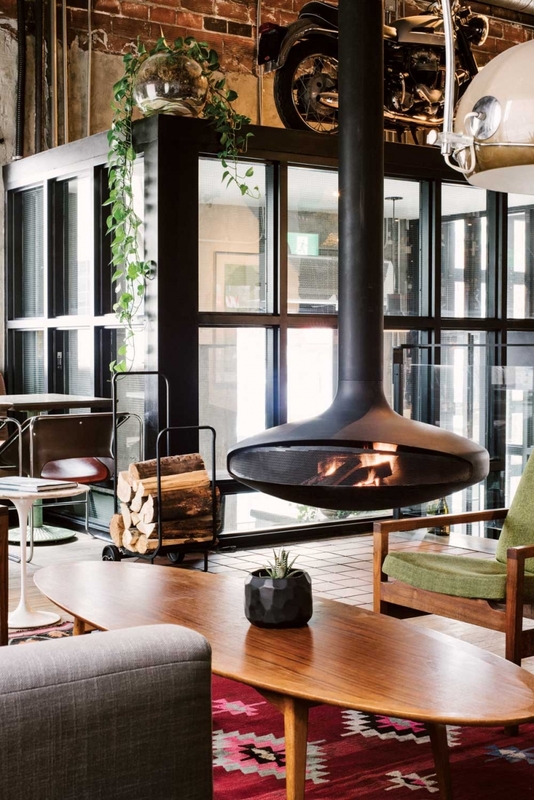 A mid-century Scandinavian fireplace hangs from the ceiling at Bridgette Bar. Wide concrete steps lead from a stylish bar area up to an even more stylish, brick-lined dining room. The scent of woodsmoke lingers in the air, tinged with fresh herbs and mustards. Diners lounge on banquettes under subtle lamps as servers whisk wood-roasted duck and pepper-glazed carrots to their tables. The latest offering from the Concorde Group (National Beer Halls, Anju, Goro+Gun) is part Mad Men set, part re-born flour warehouse and part uptown chic. It’s also the playground of chef JP Pedhirney (previously with Muse and Rouge) and general manager Dewey Noordhof (formerly at Brava Bistro), both seasoned veterans of the local restaurant scene. 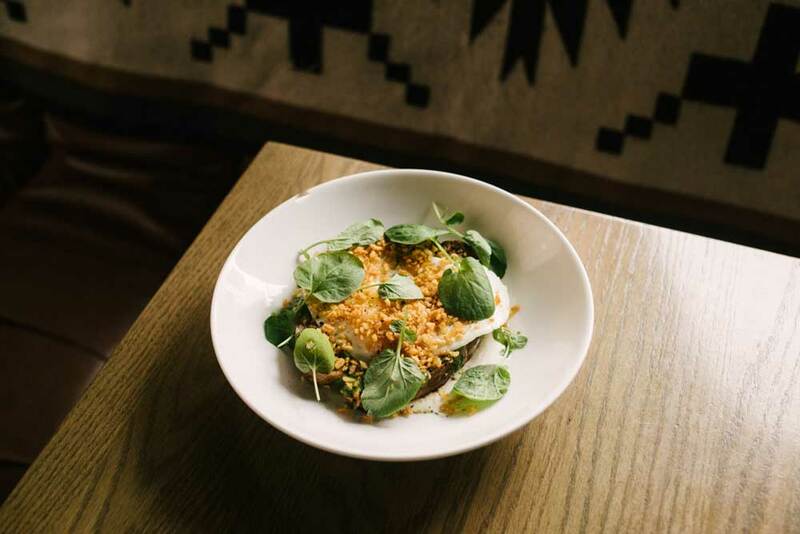 Pedhirney’s menu revolves around Bridgette’s huge wood-burning grill and oven where sausages and breads are grilled, cauliflower and ling cod are roasted and where rosemary-laced lamb sirloins are hung over the smoke to slowly absorb flavours. It’s tantalizing to watch the chefs grill, sauce and plate your food. It’s satisfying to taste fresh vegetables, including an astounding tomato salad (when in season), and it’s wonderful to savour braised rabbit on toast and even a simple piece of grilled sourdough bread here. Noordhof’s wines are impeccably chosen and his bar staff’s cocktails cling to the mid-century aesthetic. With skilled service and a delightful decor, Bridgette brings the full package. Lamb sausage with cilantro vinaigrette, labneh and fried egg. Photograph by Jared Sych.